This process works fine. If an error is thrown, the error boundary event catches it and initiates the signal end event. With the signal, the signal event subprocess will be started - so far no problem. 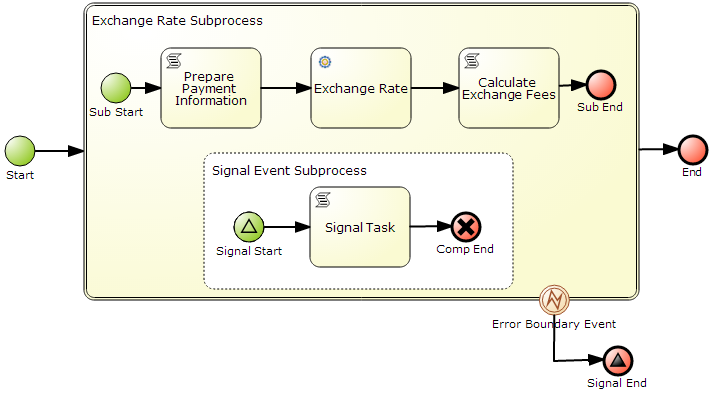 So it looks like the signal won't be communicated into the Exchange Rate Subprocess. Is that intended behavior or should that be possible? 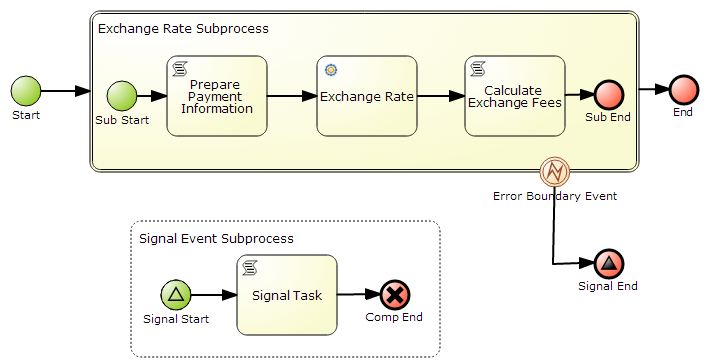 In my opinion, this is correct behavior as as soon as error is thrown the error boundary event catches it and since this is an error event it will cancel activity it is attached to (the exchange rate subprocess) and by that making the event subprocess included in it not active. That makes it unavailable to receive signals. Thus it does work as expected. Event subprocess will be active as long as its container is active. Thx for that clarification. From that perspective, that makes sense for me. unable to parse xml : Exception class java.lang.IllegalArgumentException : Compensation Event Sub-Processes at the process level are not supported. Can someone clarify that for me?